Ms. Paxon's book points out that Mexico, like most other countries, has long respected alternative and homeopathic treatments as well as traditional, conventional medicine. This is an excellent botanical store in Guadalajara. "The English Speaker’s Guide to Medical Care" in Mexico gives you all the brushstrokes to understanding medical care in Mexico within its cultural context and detailed listings that are hard to come by in one book. The beauty of this book is that for a medical reference guide, it is a painless read for a person only researching for the future, as well as a person seeking immediate help. You can read through this book in a few hours, and should do so before you even visit Mexico. Many people look for information on medical care too late, after they have had a bad experience in Mexico. As someone already living in Mexico with a few medical experiences under my belt, I wish I would have read this book before I got off the plane. For expats or those considering medical tourism, English Speaker’s Guide to Medical Care in Mexico contains 17 helpful appendices including lists of medical schools, medical history forms, specialists and dentists. Several helpful sections give information on choosing doctors and hospitals, and the types of medical training you should look for. How to approach health insurance is probably the thorniest task in moving to Mexico. Paxon’s information gives you the specifics on the various types of public insurance available in Mexico. As the author points out, homeopathic medicine is widely accepted in Mexico. The book also has source listings on homeopathic and alternative medicine. These are treatments Americans are often cut-off from due to lobbying efforts and special interest groups. I have become much more open to these treatments since living in Mexico and seen how well-versed my Mexican friends often are in them. I have had minor ailments (such as skin infections) successfully treated by homeopathic specialists working behind the counters of excellent botanicals at pennies to the dollar of what traditional treatments prescribed by doctors (both Mexican and American) cost. A newcomer might wonder about why Paxon has so much information on insect bites in the book. I don’t. Dengue fever and other infections is quite common in Mexico. The implications of an ignored, misdiagnosed or ignored insect bite make up a good percentage of medical horror stories in Mexico. Medicines for reactions to some exotic bites usually exist, but in small quantities and are hard to get, hence the need for greater vigilance. You should come away from reading this book feeling reassured. In many ways, medical training and processes are not all that different from the U.S. Like in the U.S. the quality of treatment often depends on where you are in Mexico, just like your care in the U.S. can depend on whether you are in Chicago or rural Alabama. Once you are in Mexico, living in the culture, many of the differences in how the two systems work will make perfect sense, often much more sense than America’s current healthcare system. With this guide you have all the groundwork you need for knowing what to expect and what your options are for high-quality care in Mexico at a fraction of the cost of the U.S.
Why dental costs in the U.S are so high and why you should consider Mexico. Pubmed.com comprises 27 million citations of biomedical literature from Medline.com (The U.S. National Library of Medicine). life science journals and online books. Private insurance means less hassle and lower wait times. Full-time expats often opt private insurance, since it's so much cheaper in Mexico. Here are a few things you need to know - an interview with a Mexican health insurance broker. There's a fifty-percent chance that if you every declare bankruptcy, it will because of medical bills - even if you are insured. Most recent: This colorful city between Guadalajara and Lake Chapala may be the perfect jumping-off point to explore each. 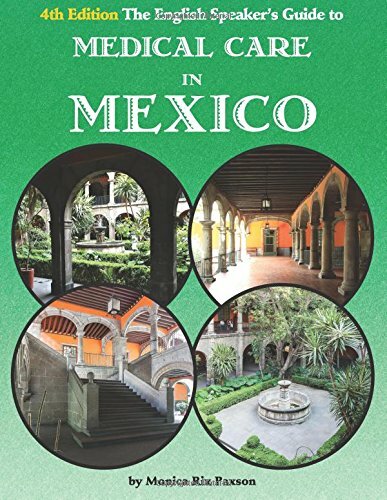 Hola, I'm Kerry Baker, the author of the Ventanas Mexico blog as well as two books. "If Only I Had a Place," a guide to renting in Mexico between three-six months. It includes a list of rental concierges to preview places you're considering. The "Interactive Guide to Learning Spanish Free Online" a curation of the best free tools on the web, organized by skill you're developing and lesson plans. Study from your tablet or laptop. I prefer to study from my beautiful Acer Aspire laptop. Thin and lightweight for travel, it's perfect for the two-country lifestyle.